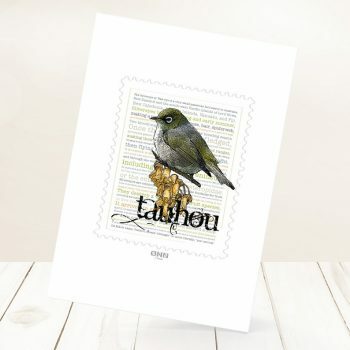 Silvereye (The Māori name Tauhou) was first recorded in New Zealand in 1832 and since there is no evidence that it was artificially introduced, it is classified as a native species. They are now wide distribution throughout New Zealand. The Cabbage Tree or Tī Kōuka is one of the most distinctive trees in the New Zealand landscape. It has lovely scented flowers in early summer, which turn into bluish-white berries that birds love to eat. 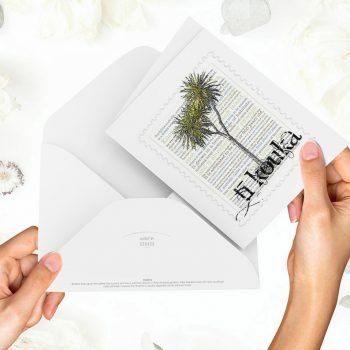 Tī Kōuka print on greeting blank card with colour-in Piwakawaka envelope. The Saddlebacks or Tieke, its taxonomic family is also known as “wattlebirds”. All members of this family have coloured fleshy appendages on either side of the beak known as “wattles”. In the case of the saddlebacks, they are a vivid red in colour. 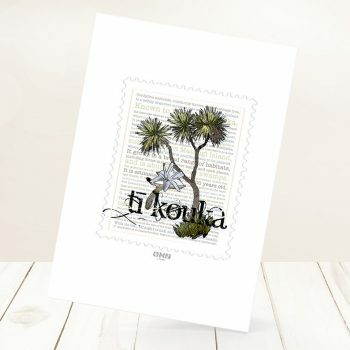 Tieke were once widespread throughout New Zealand’s mainland and island forests. 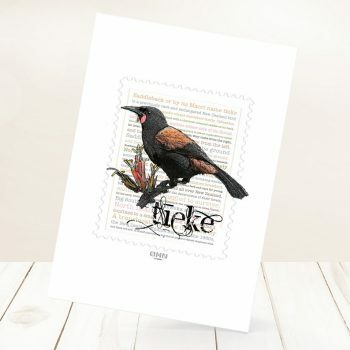 Their decline began in the mid 19th century, both North Island saddleback (Philesturnus rufusater) and South Island saddleback (P. carunculatus) were close to extinction. The most endangered of the two species is the South Island saddleback, with only 650 birds in existence. The North Island saddleback is now resident on nine large islands (7,000 ha) and is in a favourable position to survive. The South Island species is on 11 smaller islands (500 ha) and it needs translocating onto further predator-free islands if it is to recover. 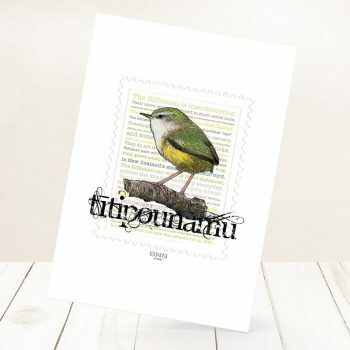 The Rifleman or Tītipounamu is one of only two surviving species within the ancient endemic New Zealand wren family. It is New Zealand’s smallest endemic bird, with fully grown adults reaching around 8 cm, weigh around 6g to 7g. 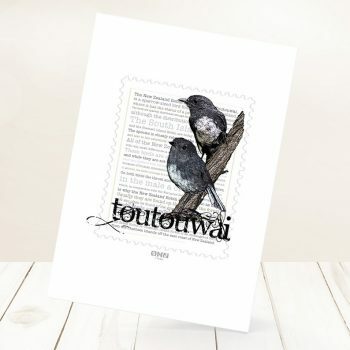 The New Zealand robin or toutouwai are friendly and trusting bird found only in New Zealand. There are three different species/sub-species of New Zealand robin: North Island robin, South Island robin and Stewart Island robin. 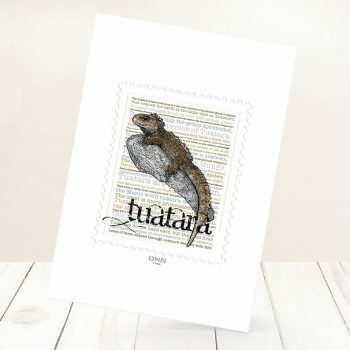 The Tuatara is a reptile endemic to New Zealand. They are the only surviving members of the order Sphenodontia, which was well represented by many species during the age of the dinosaurs. The name “Tuatara” derives from the Māori language, and means “peaks on the back”. 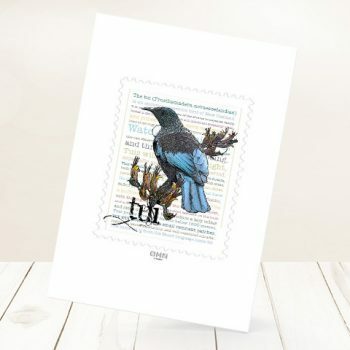 The Tui is an endemic passerine bird of New Zealand. It is one of the largest members of the diverse honeyeater family. Nectar is the normal diet but fruit and insects are frequently eaten, and pollen and seeds more occasionally. Tuis prefer broadleaf forests below 1500 metres. but will tolerate quite small remnant patches, regrowth, exotic plantations and well-vegetated suburbs. 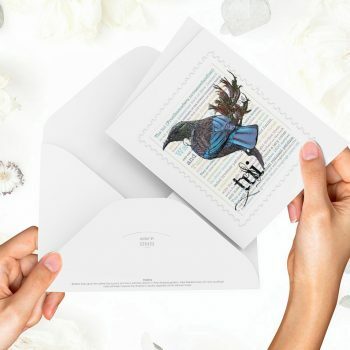 Tui print on greeting blank card with colour-in Pōhutukawa envelope.